This is one of the simplest, tastiest and useful ways to cook chicken that I know. Crystal chicken is a meal in its own right, or perfect for adding to salads, sandwiches, stirfries and other dishes. I also make an Asian-flavoured chicken rice soup from the cooking liquid. The main thing is not to remove the lid throughout the cooking process. A pot with a glass lid would be helpful in determining when the chicken hits the boiling point, but I manage fine without one. The recipe comes from our long-time family friend Margo. Put the chicken in a large pot with the ginger and garlic. Fill with cold water until the chicken is completely covered. Put a lid on the pot, and set it over a very low heat. Slow bring to a boil, then let it boil for just two minutes before taking it off the heat. Let it sit for an hour, but do not remove the lid or even take a peek. Return the pot to the heat and slowly bring to the boil again. Let it boil for just two minutes before taking it off the heat. Let the chicken cool in the covered pot until it reaches room temperature. Drain the chicken, reserving the stock. Pull the meat off the bones, cutting the breasts into large chunks. 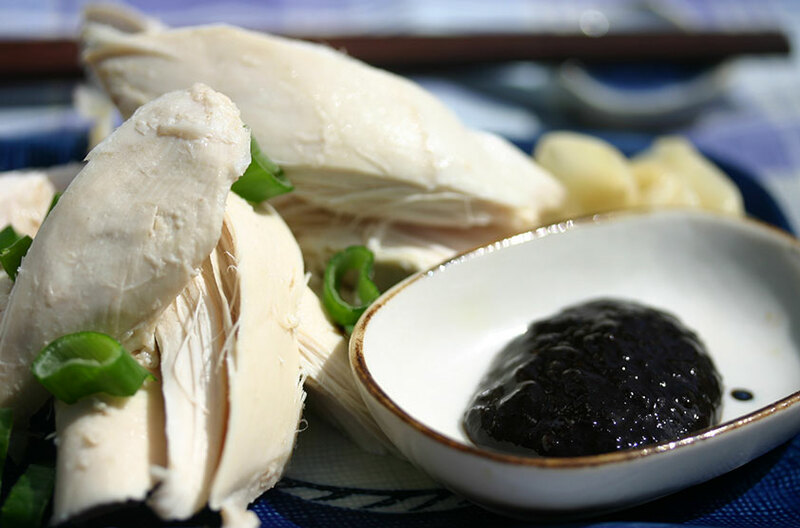 Arrange the chicken pieces on a platter garnished with spring onions, with plum sauce for dipping and pickled ginger on the side. It’s one of the best ways to cook chicken that I know. Andrea, you shared this recipe with me many years ago and it is still to this day my ‘go to’ chicken recipe. It’s the basis for so many chicken dishes, I even use it for Greek avgolemeno, which is an egg and lemon soup.